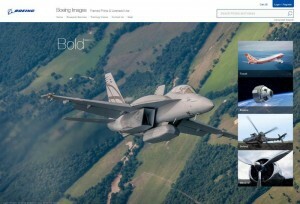 Boeing has made a redesigned photography and video website, www.BoeingImages.com, available for worldwide access. The website, which hosts nearly 15,000 photos and more than 100 videos, provides easier searching and licensing capability for commercial uses. But of these, more than 2,500 photographs are also now available for aviation enthusiasts to purchase as either prints or framed artwork. Primarily intended for commercial licensing, the company has maintained an online image gallery since 2002, featuring photographs and videos that trace almost 100 years of history for Boeing and its heritage companies. Since its founding in 1916, Boeing has been at the forefront of aerospace imagery, employing photographers and videographers with specific expertise in aviation camerawork. BoeingImages.com was created with navigation in mind. It features four galleries of images: Travel, Explore, Defend and Discover. Each gallery includes photos that reveal the past, present and future of flight and span a wide range of commercial airplanes, as well as defense and space products. Artists’ renderings of aerospace concepts and future products also are available. Individual consumers can purchase professionally printed and framed images using a credit card via a secure online payment processor. Buyers can customize orders, selecting print, mat and frame sizes and colors, for as little as $16 for an 8×10 print to several hundred dollars for large-format, museum-quality framed images. Users must first register an account before ordering photographs from BoeingImages.com. Boeing is the world’s leading aerospace company and the largest manufacturer of commercial jetliners and military aircraft combined. With a long tradition of aerospace leadership and innovation, Boeing will celebrate its 100th anniversary in 2016. Boeing makes it easy for anyone to own a little piece of aviation history. Consumers may also purchase authentic Boeing merchandise, such as model airplanes, aviation-themed attire and books online at www.BoeingStore.com or in one of the stores open to the public.